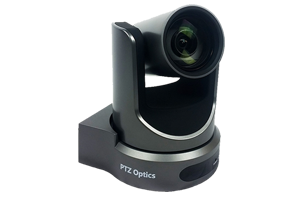 We tested a PTZOptics x20 SDI camera with our Tricaster Mini HDMI. Got control of the camera from the computer using a serial port (trip down memory lane). We are using this technology to live edit a conference meeting with a multi-camera, and using fewer camera operators. The meeting went well. We were able to preset 8 positions for the PTZ Camera and quickly go to each preset from the Tricaster. This gave the live editor plenty of options during the event. We will be buying more of these cameras.